THE MUSIC OF THE BIBLE - With an account of the Development of Modern Musical Instruments from Ancient Types. By John Stainer, M.A., MUS. DOC.MAGD, COLL., OXON. New Edition. - Cassell, Petter, Galpin & Co.: LONDON, PARIS & NEW YORK. 1882. (ALL RIGHTS RESERVED.) - Prepared for katapi by Paul Ingram, 2005. CHAPTER VII. WIND INSTRUMENTS (continued).— SUMPONYAH, SAMPUNIA, SUMPHONIA, SYMPHONIA. THIS instrument is among those enumerated in Dan.iii.15. In speaking of the psanterin or dulcimer, we had occasion to regret that the word symphonia should have been translated by "dulcimer" in our Authorised Version, when this word would have represented more properly psanterin. The symphonia is now generally supposed to have been a bagpipe. The reasons for this belief are, that the meaning of the word "sounding together" is not inapplicable to the union of melody and drone which it produces, and also that the Italians have to this day a bagpipe called sampugna or sampogna, and that chifonie or symphonie was an instrument of the same class used in the Middle Ages. Of the antiquity of bagpipes there is ample evidence. Varieties of it seem to have been common in all parts of Asia and Europe. The Greeks called it ἂσκαυλος (ascaulos), which means the "leathern-bottle" pipe (from ἀσκός, a leathern bag or bottle, and αὐλός, a pipe). The Romans gave it a name having much the same meaning—tibiae utriadariae or utricularium ; in Germany it is the sacpfeife, corresponding exactly to our bagpipe; in Italy sampogna, piva (in Dan.iii.5, &c., the Italian translation has sampogna), or cornamusa, which last means apparently a hornpipe, alluding probably to the material of which the "pipe" part was sometimes made, not only in Europe, but amongst the Arabians. From the Italian cornamusa the French adopted cornemuse, and in both countries the diminutive musetta and musette (a little inusa or pipe) seems to have been generally used. A piece of music written in the style of bagpipe music came afterwards to be called a musette. 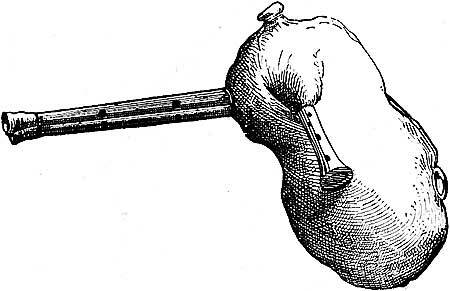 By some it is said to have been also called chalumeau by the French; but it is probable that this name was only so far used in connection with the bagpipe as to describe the pipe which was pierced with finger-holes, in opposition to that in which the drone-reed was inserted. The Gaelic name for bagpipe is piob morh; the Welsh pibau. Fig. 68 shows an Arabian instrument of this class, called by them souqqarah or zouggarah. It is of goat-skin, and the two pipes with finger-holes are tipped with horn. The scale consists of four notes, A to D of the treble stave, both pipes being in unison. It will be noticed that the goat-skin reservoir is filled by means of the little pipe seen on the left-hand side of the illustration, which is placed in the mouth of the performer. There are, in fact, two kinds of bagpipe, if viewed as to their construction. In the one the reservoir is supplied from the mouth of the performer, who blows into it through a pipe and mouthpiece; in the other the reservoir is so constructed that the pressure of the elbow against its side will force the air which it contains into the sounding-tube or chanter, as it is termed. It will be seen that the souqqarah (Fig. 68) belongs to the former of these kinds. The bagpipe shown in Fig. 69, which is an Indian instrument called tourti or tourry, is of the same kind, the inflation of the reservoir being brought about through the mouthpiece. That its chanter has only four holes is probably a proof of its great antiquity. 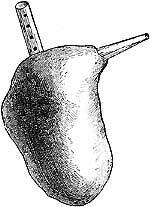 Another instrument of the same sort, called a zitty, has seven holes. So, too, the magondi (Fig. 70), used by the Indian snake-charmers when they exhibit their almost Orphean influence over the reptiles, is supplied with air from the mouth, only in this case there is no intermediate tube. 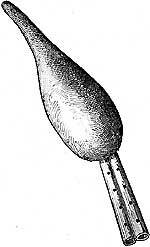 The reservoir is made of the outer coating of a gourd, the small end of which is pierced for the admission of the air. The two tubes appear to have four holes each, but one has seven, three more being pierced on the reverse side. The tone is said to be soft and somewhat sweet. The Persians have their nay or nei-ambanah, which, though somewhat different in form, is of the same construction as a bagpipe. It is interesting to note the close relationship between the arghool of the Egyptians, as before described (pp. 85, 86), and the souqqarah. The reservoir is the only distinctive feature of the souqqarah, for arghool is of two kinds, like its relations of the bagpipe family, having sometimes two pipes tuned to two unison scales; at others, two pipes, one for the playing of a tune, the other for a drone or bourdon. The broad distinction between bagpipes blown by means of the mouth and those blown by "pumping" with the elbow, before mentioned, is, however, exhibited much nearer home. Irish bagpipes are inflated by the elbow, Scotch by the mouth. Both have their special advocates, but it is said that the most ancient Irish instruments of this class were blown, like the Scotch, by the mouth. The Irish lay claim to the superiority of their bagpipes on the ground of the tenor chords which they are capable of producing. The Roman tibiae utriculariae must have been of a lower pitch than the ordinary bagpipe, judging from the appearance of one which was found depicted on an ancient bas-relief in the court of the palace of Santa Croce (Fig. 71). The almost disproportionate length of the tubes suggests very deep sounds. The sampogna, the modern Italian form of the ufricularium, is commonly played on the Campagna and the surrounding hills. Fetis remarks that when some of these poor sampognatori or sampognari migrated to Paris some years ago, in the hopes of getting a livelihood, they were popularly called pifferari, but, of course, wrongly so, as the pifferari were oboists, not bagpipers. Some are occasionally to be seen about the streets of London. The Assyrian records of this instrument are unfortunately very scanty. One is said to be shown in Fig. 72, but the reader will probably think that it might with equal justice be said to represent many other things. The Phoenicians were well acquainted with bagpipes; hence it is probable that this is the source from whence the Greeks obtained them, or imitated their method of construction, and that the Romans copied them from the Greeks. The Syrian Greeks called it σαμπονία (samponia), and the question at once arises— was this an imitation of sumponyah, a genuine Chaldaic name, or were both samponia and soumponiah corruptions of the Greek symphonia. 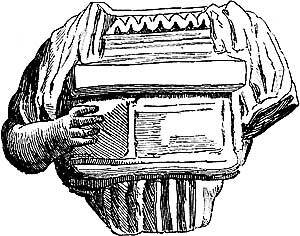 (συμφωνία); or, to put the question in other words, did the Greeks give Greek names to Chaldee musical instruments, or did the Chaldees borrow their instruments from Greece? This difficulty has been alluded to on page 42 in chap. iii. It is completely out of the sphere of the musician, and must be left for scholars and theologians to settle, or perhaps it would be safer to say, to discuss. As the symphonia is only mentioned in that catalogue of musical instruments given in Dan.iii. with such strange iteration, it must be presumed that the captive Jews did not so highly value its merits as to wish to adopt it. But harsh as the tones of a bagpipe are when heard in a small enclosed place, there can be no two opinions as to the romantic and beautiful effect they produce when heard in the midst of wild scenery; and when large numbers are played together the result is even imposing and grand. The repetition of the phrase "all kinds of musick" (Dan.iii.5, 7,10,15) would lead us to believe that a very large company of musicians was gathered together on that memorable day when Nebuchadnezzar tried to enforce idol-worship; but though the instruments themselves were of a barbarous type, we may still believe that the massive volume of sound produced by so many playing together must have been awe-inspiring and terrible.